In his comment about the small blue house Per Stromsjo remarked on how we appreciate the diversity in this kind of architectural mix from days gone by. Here we see that mix, together with our coach driver who is very worried that the bus is over-heating. 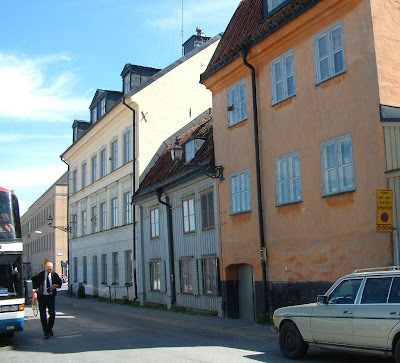 The street is called Fjällgatan and overlooks the city and all the inner islands. I suspect the majority of tourists and possibly locals alike, while admiring the distant view, overlook the interesting architecture of the street itself. Fjällgatan is always Fjällgatan, one of Stockholm's most beautiful streets.